Hand-tied with pride, this halter with 8' solid braid split reins is designed to meet the needs of bitless riders. The same quality materials and construction as the ever-popular No. 95 Halters go into this high performing design. 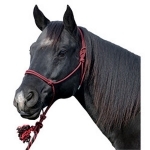 Same quality 1/4" kernmantle rope construction as our Trailblazer Halters, only with three knots at the end of the crown piece to pull through the small loop at the horse's ear. Three knots offer precise adjustment every time. With no knots to tie, this is a trainer and cowboy favorite! 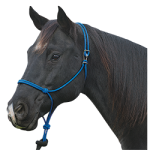 Hand-tied from 1/4" accessory cord, this halter is similar to halters used by top clinicians. 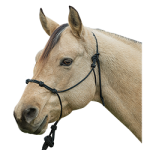 Two extra knots are strategically-placed at the noseband to encourage your horse to give to pressure and seek release. This best-selling, one-piece design has no hardware to break, making it the preferred choice of trainers, clinicians, outfitters, trail riders, working cowboys and riders from all disciplines. Hand-tied from 5/16" polypropylene 16-strand diamond braided rope of medium-firm lay that holds its shape. Product tag includes easy-to-follow instructions. This best-selling, one-piece design with clip is the preferred choice of trainers, clinicians, outfitters, trail riders, working cowboys and riders from all disciplines. Hand-tied from 5/16" polypropylene 16-strand diamond braided rope of medium-firm lay that holds its shape. Product tag includes easy-to-follow instructions. 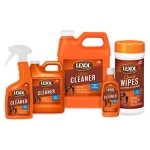 Lexol® is the best leather cleaner you can buy. Strong for tough jobs, but gentle enough for fine leather. Our formula is pH-balanced to match the pH of leather so that it safely cleans and doesn't cause harm or deterioration to leather like traditional Saddle Soap can. 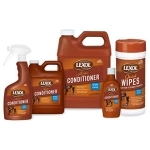 Lexol® Leather Conditioner helps to soften and renew leather. It conditions the leather, helping to protect it from cracking and premature aging, by using the finest oils to keep it strong and supple. The oils bond to the fibers in the leather and won't seep on to non-leather surfaces or your clothing. This is the same quality-made, original Weaver halter you've come to know and love! With top quality 1" nylon construction, heat-sealed oblong buckle holes, box-stitching at stress points and true-to-fit-sizing, this will be your go-to halter. This simple, non-adjustable design features a comfortable rolled throat and brass plated hardware. Zebra print overlays evoke the call of the wild in these fashion forward halters. 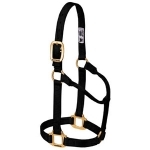 In a popular adjustable chin and throat snap style, these 1" nylon halters feature oblong buckle holes, box-stitching at stress points and true-to fit sizing. Rolled throat design for comfort. Brass plated hardware (except looped-on throat snap is solid brass). Average horse or yearling draft size. Available in Diva Pink, Lime Zest, Hurricane Blue & Black. 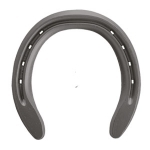 It is the simple features of the shoes, which make them the favourite of the horseshoes in America. This shoe, which is a great shape, fits with the minimum amount of adjustment. They are always level, straight from the box, every shoe being the same as the last - Kerckhaert means consistency. They have clean, open nail holes, where the nail fits perfectly, reducing the chance of lose shoes. 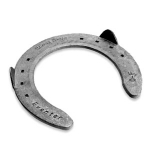 When you select either a SX7 or Standard shoe, it is made for America by The Royal Kerckhaert Horseshoe Company. The Triumph program in steel is so good to work and shape that they are a pleasure to fit, and the improved pitch makes them a dream to nail on. 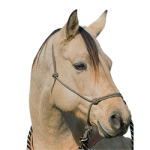 The aluminium Triumph allows the modern sport horse to perform at its maximum, while maintaining the hoof in perfect health. Our heeled shoes off a clean angled heel calk to help horses maintain their control and steady traction on rough ground. If you are headed to the high country trails, check out these special shoes. Punched for CH5 nails. 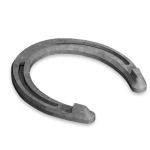 Eventer Steel grips, weight, high-performance - St. Croix steel horseshoes are drop-forged from premium steel which has the required properties expected in top-quality horseshoes and this will be evident to the farrier during fitting. 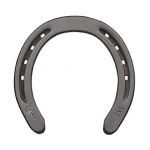 Resistant to wear, a good fit and reliable holes are expected features of St. Croix steel horseshoes. As strong as steel - the Concorde model in aluminum has the same features as the regular Concorde horseshoe but at a much lower weight. 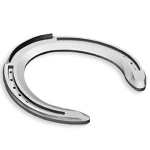 The Concorde aluminum horseshoe is the perfect choice where weight must be reduced to a minimum - for example in flat racing.